Behind closed doors, tensions run high as a lone juror argues the innocence of a teenager accused of murder. In this provocatively resonant American drama, 12 jurors from all strata of society revisit the evidence, debate the issue of reasonable doubt and confront each other's personal biases. "...But the jurors of Sheldon Epps' new production of Twelve Angry Men at Ford's Theatre just seem especially, and unconvincingly, quick to leap at each other's throats. The pitch of "Let me at him!" rage feels too easily provoked and insufficiently supported by the characterizations and performances." 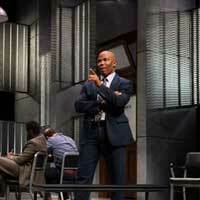 "...Twelve Angry Men features a true ensemble in the acing company. Many are familiar faces from productions at Ford's and other DC-area theaters. It is a treat to see these gifted artists work together, strength meeting strength." "...A classic American drama that has withstood the decades, Twelve Angry Men is becoming America’s version of Shakespearean drama that can be molded and remolded for new generations and new audiences without losing its power to help us locate our better angels. I can imagine any number of combinations of jurors (and even the defendant) that will bring to bear different intersections to enlighten us. Jury nullification anyone? I look forward to any and all." "...The verdict is in: "Twelve Angry Men:" that iconic courtroom drama, still remains compelling storytelling. Ford Theatre's production, gleaned from local talent and staged in the midst of racial tensions and a government shutdown, delivers a big punch and also leaves you with a slight case of "What did I really see?"" "...The suggestion that somehow the divide between the jurors is based primarily on some inherent racial prejudice is never born out-and would require far greater adaptation of the script. At best we are left to wonder whether, as each white juror changes his vote from "guilty" to "innocent," he does so on the basis of Juror No. 8's exacting ability to poke holes in the evidence creating room for reasonable doubt, or if, instead, their changes of heart are nothing more than the product of white guilt."